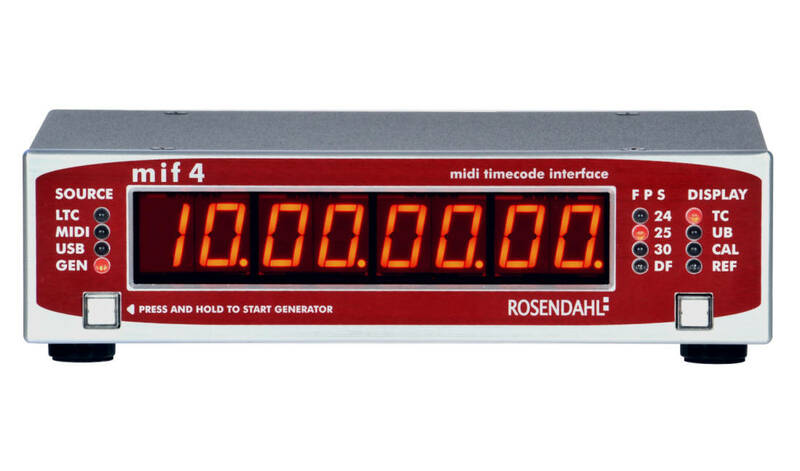 Rosendahl mif 4 is a professional midi timecode interface with LED display, sync input and USB port. The new mif4 provides professional interfacing to standard LTC (SMPTE) timecode. 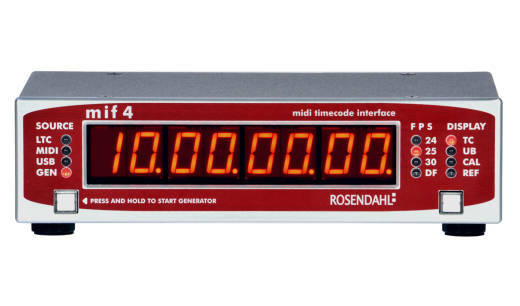 Rosendahl sync algorithms suppress timecode jitter and drop outs. • LTC input: XLR 3-pin female, balanced, pin 1 = GND, 2 = (+), 3 = (-), 10 kOhm, reads forward, reverse and stationary timecode at 5 to 500% of nominal speed (SMPTE 12M). Input level tolerance -30 to +20dBu. • LTC output: XLR 3-pin male, balanced, pin 1 = GND, 2 = (+), 3 = (-). source 1 kΏ, short circuit proof. outputs nominal forward and stationary timecode (SMPTE 12M). output level adjustable from 0.. +8dBu (5.5Vpp). • MIDI input: 5-pin DIN connector, MIDI specification 1.0. MTC quarter frames, MTC full message (time and userbits), MMC stop, play, defplay, locate, write userbits (field 47) Rosendahl Sysex. 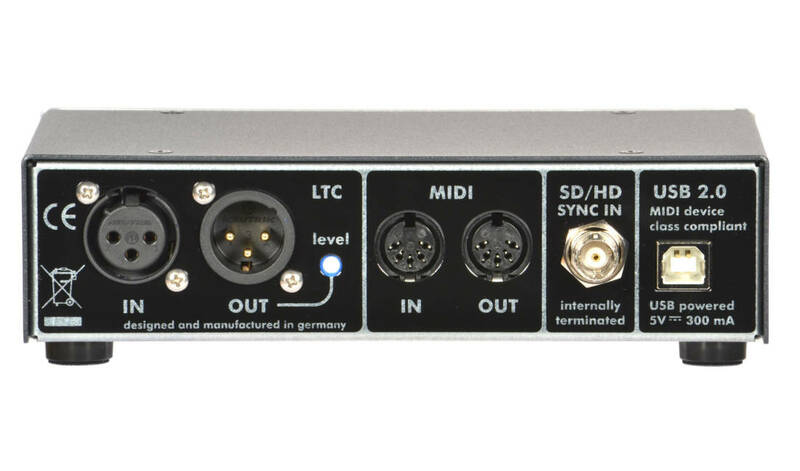 • MIDI output: 5-pin DIN connector, MIDI specification 1.0. MTC quarter frames, MTC full message, Rosendahl Sysex. • USB: USB type B, device class compliant MIDI (USB audio). plug & play with Windows XP or later, MAC OSX. MTC quarter frames, MTC full message (time and userbits), MMC stop, play, defplay, locate, write usebits (field 47). Rosendahl Sysex. • Sync input: BNC, internally terminated, 300mV sync, +/- 300mV tri-level. Auto detection of the following video standards: 576i47.95, 576i48, 576i50(PAL), 480i59.94(NTSC), 480i60, 720p50, 720p59,94, 720p60, 1080i47.95, 1080i48, 1080i50, 1080i59.94, 1080i60, 1080p23.98, 1080p24, 1080p25, 1080p29.97, 1080p30, 1080p50, 1080p59.94, 1080p60. • Power: USB bus powered, 5V DC, < 300mA via host computer or stand alone operation with separate external power adapter. • Dimensions: 0.56" 7-segment LED display. 1U rackmount brackets are included, weight 0.6 kg.